From what I've heard, meatloaf has a bit of a bad rep even though it's considered to be a quintessential American comfort food. Apparently, school cafeteria meatloaf with its mysterious lump of meat submerged in some runny brown sauce has some people scarred for life. I wish I could relate but I really can't because I wasn't raised in the American public school system and had never actually tasted meatloaf until I was in my late twenties. My first encounter with meatloaf was at a Claim Jumper restaurant and I must say, I really enjoyed it. I also tried it out at a few other restaurants before finally attempting it at home. The biggest trial and error I've had with meatloaf is texture, specifically moistness. It took me quite a few tries before I was finally able to make one heck of a moist meatloaf and folks, this is it! I used to top the meatloaf with plain ketchup but now I jazz it up with a few more ingredients to make it a spunkier ketchup-based glaze. 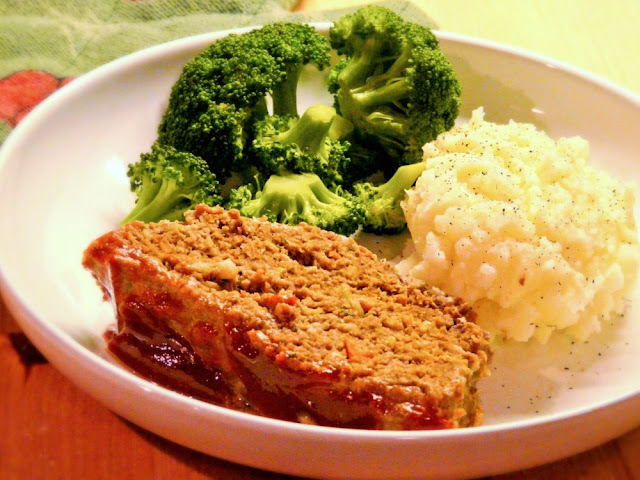 Serve this meatloaf with some fluffy mashed potatoes and those school cafeteria meatloaf days will become nothing more than a distant memory. I usually like to prepare the meatloaf mixture about one-hour before baking so that the meat can infuse the seasonings better but you can certainly put it together right before baking if you lack the time. Place the chopped carrots, onions and celery in a food processor and pulse a few times until they are finely chopped but not pureed. Heat the olive oil in a frying pan and saute the garlic until fragrant but not browned. 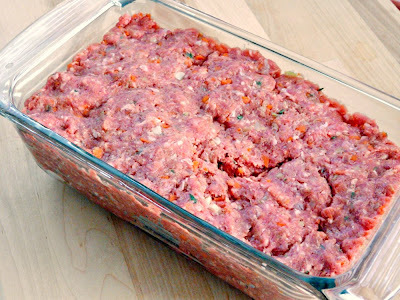 Add the minced carrots, onions and celery and sweat them for about 4 to 5 minutes until they've softened a little. Remove from heat and set aside. Place the ground beef in a large mixing bowl. Add the cooked carrots, celery, onion and garlic followed by the bread crumbs, salt, pepper, beaten egg, Worcestershire sauce, thyme and parsley. Using clean hands, gently fold the ingredients into the ground beef a few times until everything is mixed in and distributed well. Transfer the mixture to a loaf pan and pack it in well. In a large bowl, combine all glaze ingredients together with a whisk. 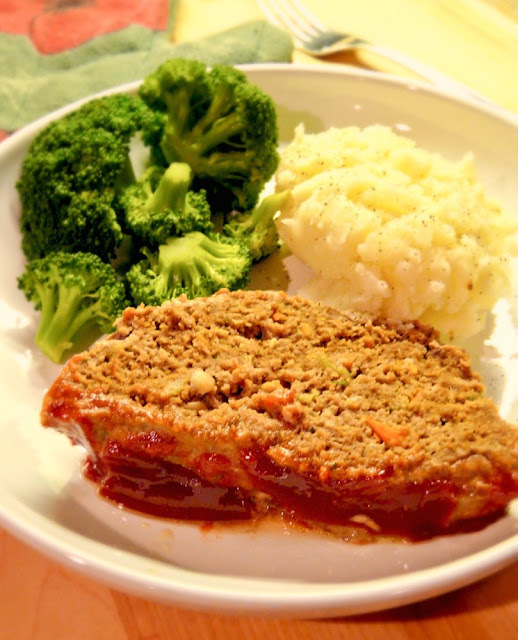 Brush the glaze over the meatloaf and bake it in the oven for one hour. 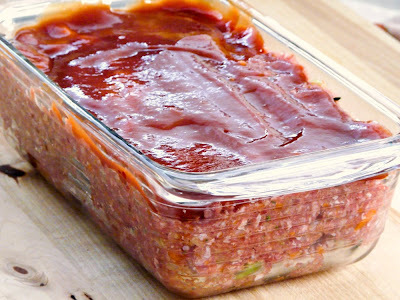 When the meatloaf is done, remove from the oven and set aside for about 10 minutes before slicing and serving. Serve with leftover glaze and accompany with mashed potatoes and vegetables. Here's another comment from your number one fan. I made this meatloaf for dinner tonight and both the hubby and kid gobbled it up. I did miss a few ingredients though and I also had a couple of other modifications. First of all, I didn't have the dried parsley or the onion powder as listed on this recipe because they didn't sell it at Trader Joe's. I didn't have time today to find these ingredients at a different store. I was also a half a cup short on ketchup so that minimized the amount of glaze I wanted. Finally, I only used a very small amount of celery since the hubby can't stand celery. Overall, it turned out pretty good. It's just so nice when my kid eats what I make without any complaints. Next time, I'm going to have the dried parsley and onion powder in stock with a giant bottle of ketchup. I think I'm also going to try not using any celery at all since I was a bit paranoid that the hubby wouldn't like it. Since I knew I wouldn't have enough time to make the potatoes, I bought frozen mashed potatoes from Trader Joe's and heated it in the pan. It turned out pretty good. I also steamed some organic broccoli, which was quick and easy. As always, thanks for sharing your easy recipe!